Most Hollywood movies like to end on a triumphant note. The aliens are defeated in Independence Day. The Death Star is destroyed in Star Wars Episode IV: A New Hope. And Marty McFly makes it back to the future in Back to the Future. But sometimes it’s refreshing to see a film in which everything goes wrong in the end and the heroes are sorely disappointed. That’s okay, though, because they win some sort of moral victory in spite of losing the big battle, race, or game. I’m sure there are plenty of films that demonstrate that winning isn’t everything. Here are five of my favorites. “Hey, Jamaica, we got a bobsled team!” You can’t help but repeat that chant over and over in your head after watching this feel-good film. It has everything: John Candy acting his heart out in his last great role, a predictable but effective father/son rift subplot, a memorable ensemble cast all doing a great job, and, to top it all off, it’s all based on a true story. Seeing the Jamaicans win small victories to try to be taken seriously at the 1988 Winter Olympics is inspiring. 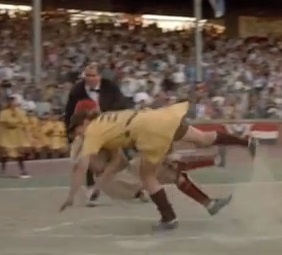 The film keeps building the suspense until it reaches a fever pitch in their final race when suddenly tragedy strikes. The bobsled malfunctions at a critical moment and the bobsledders careen dangerously down the track. 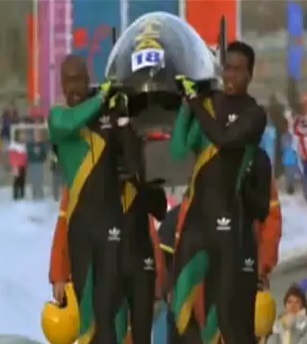 But rather than admit defeat, they valiantly stand up and carry their damaged bobsled across the finish line. They didn’t win the race, but they won the respect and admiration of the world. Glory is ironically named. It’s full of small victories, like the Union Army allowing African Americans to enlist, supplying them with shoes and rifles, allowing them to see real combat, and giving them the honor of making a seemingly suicidal charge on a Confederate fort. Neither the officers nor their men receive much glory for their efforts. But it’s the legacy they forged through their courage and sacrifice that allowed future generations to reap the benefits. The film ends with every main character being shot and killed in a brutal battle scene. The soldiers are then haphazardly buried together in a giant mass grave by the victorious Confederates. In a further insult, we are told that the fort was never taken by the Union Army until the end of the Civil War. But Abraham Lincoln credited those brave African American soldiers with turning the tide of the war, so that certainly counts for something. It’s not so much the effect those men had on the war, but the effect the war had on them that is so fascinating to watch. They are so eager to see battle at the start, but when they finally come face to face with the ugly reality of combat, they are forever changed. The white soldiers slowly lose their prejudice, and the black soldiers begin to realize that the white soldiers have been fighting and dying for them and their future. Another movie based on a true story. It’s funny how real-life events don’t often have a perfectly happy ending. But their bittersweet qualities make them more emotional and satisfying. During World War II, American actors, athletes, and members of virtually every other profession enlisted in the armed forces. Can you imagine such a thing happening today? This created a serious problem in keeping Major League Baseball going with all the best players getting drafted by the Army rather than the Yankees. So an enterprising businessman came up with a brilliant solution: Create an all-women baseball league. The first part of this film has a quasi-Wizard of Oz feel to it. Two baseball-loving sisters travel across the country as their scout picks up several other prospects for the new league. They all bond in unique ways, especially after they make the cut during tryouts. However, a lot happens during the course of the film, and the two sisters have a falling out after they wind up on opposing teams. During the big final game, it all comes down to the two sisters. The younger, more headstrong one is rounding the bases trying to score the winning run while the other is a little older and a lot wiser, and she’s guarding home plate. No matter what happens, a character we love is going to go home disappointed and empty-handed. The two collide and the ball falls out of the older sister’s hand. Thus, the little sister and her team prevail. But that’s not where the story ends. The film is bookended in modern times with all of the women we saw in their youth now old ladies hobbling around a museum full of artifacts of their adventures. It’s gut-wrenching and heartwarming to see all of the reunions of these wonderful women. It’s even sadder when we realize the reunions that didn’t take place because some of them had passed away. The song they sing at the end is a fitting tribute to these amazing ladies. It’s a tribute to the fact that you’re only as old as you feel. And these women will be forever young. This one isn’t based on a true story, but it is another great baseball film. Often overlooked, Little Big League came out in June 1994, and it was swallowed up by Speed, The Lion King, Forrest Gump, True Lies, and numerous other huge releases that came out right around it. It tells the story of a child prodigy who has the history, rules, statistics, and mechanics of baseball down so tight in his mind that he turns out to be the ideal head coach of the Minnesota Twins. Far-fetched? Sure. But this is fantasy and wish fulfillment done extremely well. The kid is believable. He has one quirk that makes him a good coach, but he’s also dealing with preteen insecurities, friend issues, family conflicts, moral temptations, and many other things that make his character real. After finally gaining the respect of his players (who think it’s a joke to play ball for a kid), it looks like the kid is going to take the Twins to the playoffs after they play a Wild Card game with the Seattle Mariners. I grew up in the Puget Sound, so the Mariners were my team all through the 1990s. I have a lot of mixed feelings about the last game. On the one hand, I want to see the Twins do well, but on the other… GO MARINERS! In the end, it comes down to one final at-bat. 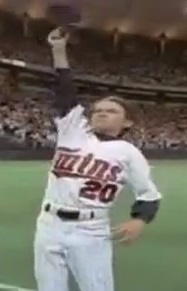 The Twins hitter launches the ball deep into center field. It looks like it’s definitely going to be a game-winning home run. But then Ken Griffey, Jr. leaps up and snags the ball out of the air. The Twins lose and the Mariners gather around and celebrate their sweet, sweet victory. But the kid wins in other ways. His players all pledge their loyalty to the team for the next season, he makes peace with his friends and other people he cares about, and the crowd refuses to leave the stadium without giving him a standing ovation for all that he achieved. Not bad for a rookie coach. One of the best sports dramas of all time, Rocky is the ultimate underdog story because it’s so realistic. The underdog doesn’t have one chance in a million of winning, and he doesn’t beat the odds. Now that’s a great idea that is executed perfectly in this film. In a twist of fate, Rocky Balboa is selected to fight the World Heavyweight Champion, Apollo Creed, despite Rocky being just a lowly Philadelphia city boxer. He works so hard to get into fighting shape while winning the affection of the girl of his dreams and dealing with his emotional insecurities. You can’t help but cheer for the guy in his hopeless cause. The night before the big fight, Rocky realizes that it’s impossible to beat Apollo, so he settles for the moral victory of going the distance against him. No one ever managed to go all 15 rounds with Apollo. He had always won by knockout. But if Rocky could somehow manage to make it the whole way through, he could stand tall the rest of his life knowing that he had done something special that no one else could have done. The boxing match at the end of the film is wonderfully shot, edited, and choreographed. It feels real, just like the rest of the film. It looks like Rocky might have a chance of winning in the end because Apollo had underestimated him so much. But Rocky’s efforts don’t prove to be enough as Apollo wins the split decision. But in its final moments the film doesn’t focus on the fact that Rocky lost the fight, but the moment when he won the heart of his girlfriend, Adrian. After five sequels (four of which Rocky triumphs in), the original Rocky is still the champ. This entry was posted in Random Stuff and tagged baseball, civil war, drama, films, major league baseball, movie review, movies, rocky, sad, sports, tearjerker, war. Bookmark the permalink. Nice selection and recaps. It almost seems like winning by losing is more satisfying at times. Wow, I didn’t even remember that Rocky lost the fight. I remember him being gloriously victorious at the end. This really does show that winning isn’t everything. It’s so perfect because the focus completely shifts from the result of the fight to Rocky and Adrian embracing in the end. He got to go the distance and she gets to come out of her shell and be with the man she loves. The ending couldn’t be more perfect. ‘Rocky’ and ‘Rocky Balboa’ are my two favorites of that series: the best acting, AND the best writing. And the rest of the movies listed were winners, in every sense of the word that matters. Thank you. You are so kind. 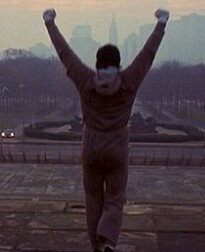 Rocky is definitely among the best films ever made. I love when movies throw me for a loop but still leave me smiling in the end. It’s much harder to do that than making a straight tragedy or a predictable happy movie. How about Saturday Night Fever? Travolta and co. do win, but realize they had an unfair leg up being from the neighborhood. I have to admit I have never seen that movie, and I’m a huge John Badham fan. WarGames, Short Circuit, and Stakeout are all classics in my book. I’ll have to check out Saturday Night Fever eventually.